The CrossFit Games are the ultimate proving grounds for the Fittest on Earth. Only the top fraction of a percent will advance from the Open and Regionals to earn the chance to compete on the big stage. For the second consecutive year, the CrossFit Games will be held in Madison, Wisconsin. This year’s event will be held at the Alliant Energy Center, Aug. 1-5. Tickets are on sale now and can be purchased here. During downtime in the competition, fans can take part in many activities. There will be more than 200,000 square feet of exhibitors and sponsors, a 20,000-square-foot beer garden, an expanded food court and seating area, space for RV and tent camping, 20,000 square feet of spectator workout space, opportunities to try the same workouts as the athletes, live demonstrations from CrossFit subject-matter experts, concerts and more. The entire city of Madison will be geared up for the Games, offering great dining, drinking and outdoor activities throughout the city. After you book your tickets to the CrossFit Games, be sure to book your lodging. If you have yet to secure a spot for your stay while in Madison, don’t worry, many options are still available. Book discounted CrossFit Game hotel rooms: CLICK HERE. If you need to reserve or book 10 or more rooms, please CLICK HERE and fill out the sub-block form. To cancel or modify your existing reservation, please use the link provided in your email acknowledgement and do not contact the hotel directly. 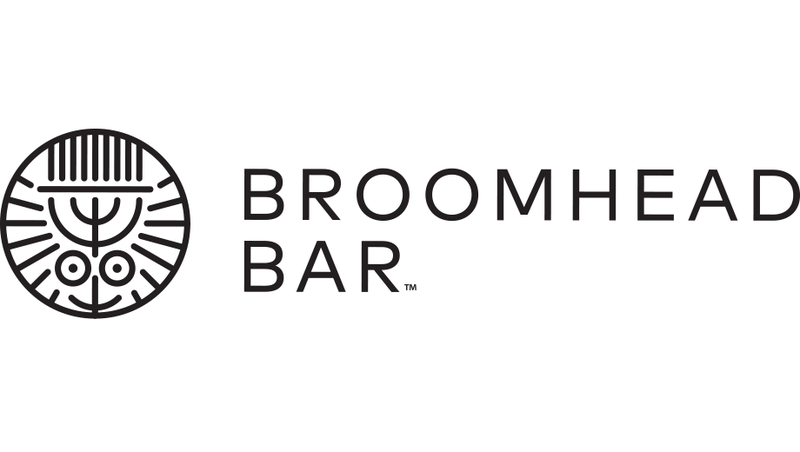 If you lost or deleted your confirmation e-mail, or have questions about the CrossFit Games hotel options, please contact Connections Housing at 678-730-2519 or by e-mail at CrossFitGames@connectionshousing.com. While RV and Camping Rx'd packages are sold out for 2018, tent camping spots are still available. Read the detailed FAQ regarding RV and tent camping policies here. Additional camping information can be found in this article. Airbnb is a fun way to stay with a group of friends and make Madison feel like home. Check out the rentals available in Madison here. Rent a whole house for half the price of a hotel with VRBO. Up for an adventure? Procrastinate booking a hotel room? Check out Madison Couch Surfing. Noisemakers, whistles, air horns, musical instruments, drumsticks, cowbells, etc. Professional camera equipment, video cameras, tripods, etc. Weapons, explosives, pepper spray, tear gas, etc. Fireworks, slingshots, smoke bombs, laser pointers, etc. Water guns, toy/replica weapons, squirt bottles, soap bubbles, etc. Beach balls, Frisbees, balloons, brooms, skateboards, in-line skates, skates, etc. Sticks (including selfie sticks), poles, rods, etc. Guests found in possession of any of the above-mentioned items will be asked to remove the item(s) from the facility or dispose of it. Guests found in possession of the above-mentioned item(s) inside of the facility may be subject to the confiscation of the item(s) or possible ejection. Guests found in possession of fireworks or explosive devices will be ejected from the facility. Guests who refuse to comply may be denied entry or be ejected from the facility and may be subject to arrest. The CrossFit Games will take place at the Alliant Energy Center, located at 1919 Alliant Energy Center Way, Madison, Wisconsin, 53713. 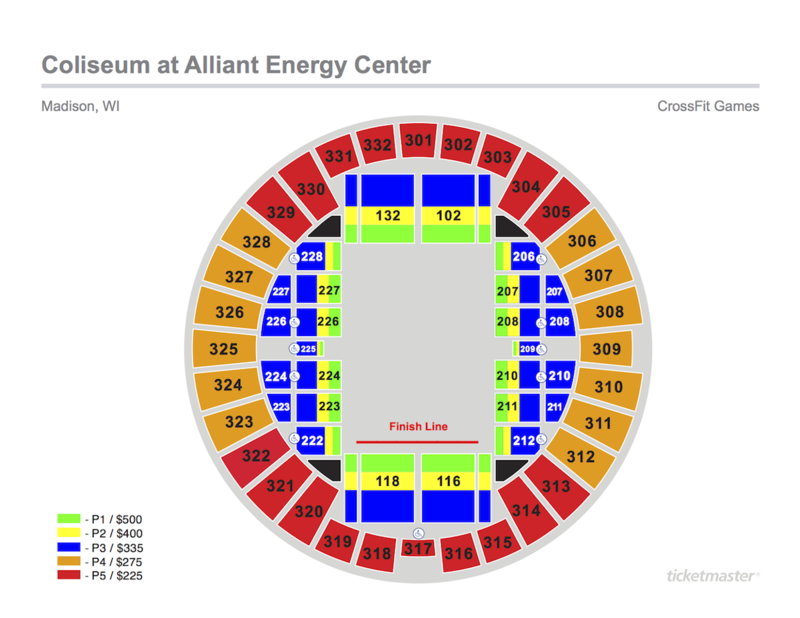 The Alliant Energy Center is located at the gateway to downtown Madison, Wisconsin, just off the Beltline (Hwys. 12 and 18) on John Nolen Drive & Rimrock Road. The venue is just minutes from Interstate 90/94 (via Hwys. 12 and 18), the State Capitol, Madison’s State Street area and the University of Wisconsin-Madison campus. It's just 15 minutes from the Dane County Regional Airport, which has non-stop flights to and from many key destinations, getting get you anywhere in the world through connecting hubs. The Alliant Energy Center is a prime site, situated near three major metro areas—250 miles from Minneapolis, Minnesota, 145 miles from Chicago, Illinois, and 75 miles from Milwaukee, Wisconsin. From Chicago, IL (South): Take I-90 to Exit 142A; head West on Hwy 12/18; drive 5 miles to Rimrock Road (Exit 262). From Green Bay, WI (North): Take I-90 to Exit 142A; head West on Hwy 12/18; drive 5 miles to Rimrock Road (Exit 262). From Milwaukee, WI (East): Take I-94 West to I-90 South; take Exit 142A; head West on Hwy 12/18; drive 5 miles to Rimrock Road (Exit 262). From Minneapolis, MN (West): Take I-90 South to Exit 142A; head West on Hwy 12/18; drive 5 miles to Rimrock Road (Exit 262). From Des Moines, IA (South): Take I-80 East to I-380 North; head North on Hwy 151; take Hwy 12/18E to Rimrock Road (Exit 262). Once on Rimrock Road, follow the signage and traffic patterns to enter into one of the many entrances into the Alliant Energy Center. In 2018, all parking at the CrossFit Games is free to spectators. Paved parking is limited, with backup grass parking located in Quann Park. It is highly recommended that spectators consider utilizing one of the various alternative modes of transportation that Madison has to offer. 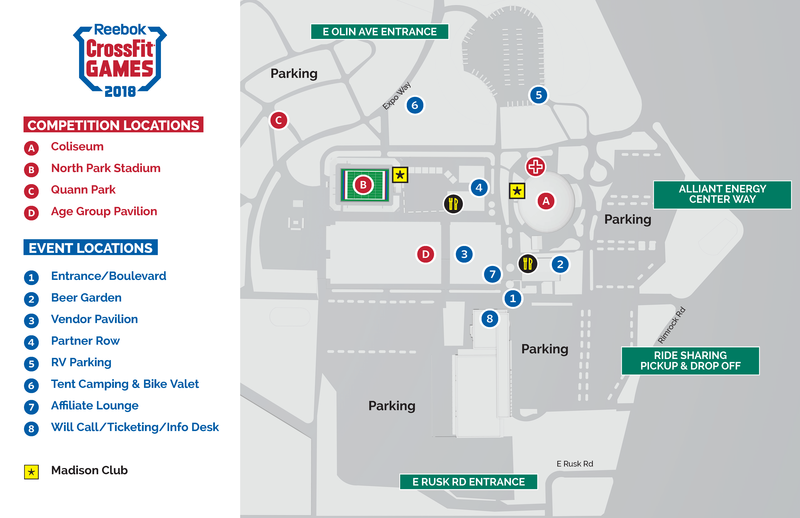 There will be plenty of designated on-site bike parking! One of only five cities to reach platinum-level status as a bicycle-friendly community, Madison has nearly 75 miles of off-street bicycle paths, 120 miles of on-street bikeways, designated safety zones at intersections and parking all around town. Interested in renting a bike? Check out your options at BCycle, Machinery Row Bicycles or Budget Bicycle Center. Machinery Row rents bicycles by the day, week or month. They currently rent Trek Verve 3 and Trek 7200 hybrid bicycles in 15-in., 17.5-in., 20-in., 22.5-in. and 25-in. frame sizes. Ladies’ bicycles are available in 13-in., 16-in. and 18.5-in. frame sizes. With adjustable stems, suspension forks and suspension seat posts, these bicycles provide a comfortable fit and easy ride. Helmets and locks are available at no extra charge. Visit them at 601 Williamson St. to rent your ride for the week! Budget Bicycle Center rents bicycles by the day, week or month. Rates start at $10 per day. Helmets, maps and locks are available at no extra charge. Budget Bicycle Center offers assistance in finding the right bicycle to rent for your individual needs. Wondering where to ride, eat or grab a beer? Local expertise is always on the house. Madison Metro bus service has regular stops along John Nolen Drive, Olin Avenue and Rimrock Road. There are currently two bus stops on Rimrock Road, two on John Nolen Drive and one on Olin Avenue, adjacent to the Alliant Energy Center. Visit www.mymetrobus.com to plan your trip. The world’s fittest fans leave their cars behind and let Uber do all the work. Uber will get you to the Games in Madison, Wisconsin, without the hassle of driving or parking. Wherever you’re headed in the Madison area, count on Lyft for a ride within minutes. The Lyft app matches you with friendly local drivers at the tap of a button. Just request and go. After the ride, simply pay through your phone. Choose Alfred because you deserve only the most professional and knowledgeable drivers. Alfred will arrive in a Mercedes, Volkswagon or luxury SUV to provide a professional, courteous and safe transportation experience. Green Cab is an eco-friendly taxicab service providing cheap, alternative public-passenger transportation to all of Madison, Dane County and beyond. Green Cab provides coverage 24 hours a day, seven days a week, 365 days a year. Union Cab operates the largest taxi fleet in Madison. Their experienced staff and drivers provide over 400,000 rides annually. Mad City Limo & Car Service is a full-service Wisconsin transportation company. Their limo fleet consists of luxury sedan cars, SUVs, limos and limo buses. Let them take the stress out of airport transfers and all your special occasion transportation needs. Mad City offers personal and professional limo service to accommodate every customer's needs. Book your next executive transportation service with AJ Prestige Madison Limo Service and Worldwide Transportation and you’ll receive reliable service from expert chauffeurs. They specialize in corporate travel for airport transportation and business meetings, and cater to out-of-town guests. Avoid the flashy stretch limos with one of their corporate sedans, which provide the perfect amount of comfort and style. The 2018 Reebok CrossFit Games will use high-tech, RFID-enabled wristbands to maximize your CrossFit Games experience. Your wristband serves as your admission ticket to enter the Games fast—with just a quick tap of your wristband—so make sure it's registered ahead of time. Many major music festivals and live sports events have turned to RFID-enabled wristbands to allow attendees to come and go freely between venues. We believe it's a natural fit for the CrossFit Games. If you've never used them before, it's important you take a few minutes to learn how they work. When purchasing CrossFit Games ticket packages, you'll have the option to have the packages mailed to you or placed at will call. If you live in the United States and would like to have your packages mailed, your purchase must be completed by July 9, 2018. If a purchase is made after this date, your package will be available at will call. You will need to bring your confirmation email and a valid photo ID to will call to receive your CrossFit Games wristband. Buyers from outside the United States must complete their purchases by June 22, 2018, in order to have their packages mailed. International buyers who purchase packages after June 22, 2018, may only claim their wristbands at will call. Do NOT put your wristband on until the morning of the Games. Once you put it on, it will lock instantly and you won’t be able to remove it. When you receive your wristband in the mail, you must register it online before you arrive at the festival. Please check back for the registration link. If you ordered multiple wristbands, make sure each person creates a new account and registers with their information before arriving at the Games. Please do NOT register someone else’s wristband for them. It costs $10 to replace lost wristbands. Once you receive your CrossFit Games wristband in the mail, register it online. If you ordered multiple wristbands, make sure to give a wristband to each of your Games buddies and have them each create a new account and register with their information before arriving in Madison. Please do NOT register someone else's wristband for them. This helps us track your unique wristband in case it gets lost or damaged. Only wristbands purchased from the official Ticketmaster website and ticketing partners are valid; do not purchase wristbands from third parties. Take care of your wristband and treat it like cash. Wristbands are non-transferable and non-exchangeable. Wristbands that are lost or stolen will only be replaced to the original purchaser or registered attendee and are subject to a replacement fee. Wristbands will be treated as void if tampered with or removed. Do not cut them. Do not remove your wristband until after the final day of the Games. Wristbands must be worn on the right wrist. Check out the video below to learn more about your RFID wristband and how to put it on correctly. Do NOT wear the wristband until the first day of the Games! Once you put it on, you won't be able to remove it, as it has a one-way locking mechanism. Keep it on throughout the duration of the Games. HOW WILL COLISEUM ACCESS WORK? Your RFID wristband is programmed to know where you're allowed to go. If you purchased Festival + Coliseum tickets, you will be able to swipe your wristband at the Coliseum and enter the venue. By registering your RFID, you will automatically be entered into a drawing for a chance to win a weekly Madison Club pass (valued at $1,000), and upgrade your ticket from a Festival Pass to a Festival + Madison Pass. DO I NEED TO DO ANYTHING WITH MY WRISTBAND BEFORE THE GAMES? Before you arrive at the Games, please register your wristband online here. WHY SHOULD I REGISTER MY WRISTBAND ONLINE? Registering your wristband protects you in case your wristband is lost, stolen, damaged or stops working. Only the person who registers a particular wristband or the original purchaser can be issued a replacement wristband. We won’t know it’s yours unless you register it. WHEN WILL I RECEIVE MY WRISTBAND? Those who purchase tickets by 11:59 p.m. on July 8, 2018, will receive wristbands in the mail by July 19, 2018. As each order is fulfilled, an email will be sent with your USPS tracking number. Once you receive your wristband, remember to register it before you arrive at the event. For those who purchase tickets after 11:59 p.m. on July 8, 2018: Bring your e-ticket (mobile or printed) and photo ID to Will Call on site to exchange your ticket for your wristband. WHERE IS WILL CALL LOCATED AND WHAT ARE THE HOURS OF OPERATION? Will Call will be located at the north end of Exhibition Hall. Monday, July 30 - 9:00 a.m. to 5:00 p.m.
Tuesday, July 31 - 9:00 a.m. to 5:00 p.m.
Wednesday, August 1 - 7:00 a.m. to 7:00 p.m.
Thursday, August 2 - 7:00 a.m. to 5:00 p.m.
Friday, August 3 - 7:00 a.m. to 6:30 p.m.
Saturday, August 4 - 7:00 a.m. to 6:00 p.m.
Sunday, August 5 - 7:00 a.m. to 5:00 p.m. I PURCHASED MY TICKETS BEFORE 11:59 P.M. ON JULY 8, 2018, BUT HAVEN’T RECEIVED MY WRISTBAND IN THE MAIL YET. WHO SHOULD I CONTACT? Wristbands will ship in batches beginning on July 6, 2018, and should be received by July 19, 2018. If it is past July 19, 2018, and you have not received your wristband, please email crossfitgames2018@fulfillmentsupport.com with your ticket order number, along with the purchaser’s full name and mailing address. I LOST MY WRISTBAND/NEVER RECEIVED IT IN THE MAIL. HOW DO I GET A REPLACEMENT? Please visit Will Call on site for a replacement pass. Make sure you bring your e-ticket as well as your photo ID. If you are not the original purchaser, you will need to bring a letter from the original purchaser outlining his or her consent for pick-up, as well as a copy of his or her photo ID. If you have registered your wristband online, we will be able to retrieve your information with the name and email address you provided upon registration as long as you have a matching valid photo ID. To provide you with a replacement, we will deactivate your old wristband and activate a new one for you. Replacement wristbands are subject to a replacement fee. If you have NOT registered your wristband online, we may be able to retrieve your original ticket order. However, the original purchaser must be present with a matching valid photo ID in order to issue a new wristband to you. We would also need to know the UID number (longer set of digits found on the back side of the RFID saddle) of the lost wristband to deactivate it. The CrossFit Games are NOT responsible for lost or damaged wristbands. Play it safe and register your wristband before you arrive! THE ORDER THAT WAS SHIPPED TO ME IS MISSING WRISTBANDS OR IS DIFFERENT FROM WHAT I PURCHASED. WHAT SHOULD I DO? Wristbands are shipped by order, meaning that if you purchased tickets at different times, they will be shipped to you separately. Wristbands are fulfilled and shipped in batches, so you may not receive all your orders on the same day. I NEED TO CHANGE MY ADDRESS. WHO SHOULD I CONTACT? All address changes must be made before 11:59 p.m. on July 8, 2018. After this, we will be unable to make any address changes. However, you can request to pick up your order at Will Call by emailing crossfitgames2018@fulfillmentsupport.com. I NEED TO CHANGE/ADD TO MY ORDER. WHO SHOULD I CONTACT? All orders are non-transferable and non-refundable. However, if you have questions about what you purchased, please email: support@crossfitgames.com. To buy additional passes, please select “Tickets” above. MY BUDDIES AND I PURCHASED OUR TICKETS THE SAME DAY. THEY RECEIVED THEIR WRISTBANDS, BUT I HAVE NOT RECEIVED MINE YET. SHOULD I BE WORRIED? Still have questions? Please e-mail support@crossfitgames.com or crossfitgames2018@fulfillmentsupport.com. The North Lot Stadium now will include over 10,000 seats—nearly 50 percent more than the 2017 stadium—plus plenty of standing room, a massive video board and food and beverage options galore. Weeklong Festival Tickets are $99 (plus a $10 facility fee) and provide access to all five days of the CrossFit Games, including the Opening Ceremonies on Thursday. Single-Day Festival Tickets will go on sale Tuesday, June 19, and be available here. These tickets provide access to all competition events on a specific day, with the exception of individual and team events inside the Coliseum. Single-Day Festival Ticket prices vary by day. If you only purchase a Festival Ticket, you will have complete access to the masters and teenage competitions, as well as all outside events for the teams and individuals. The Alliant Energy Center campus also will have ample access to video boards where you can take in all the action. If you are not in the Coliseum, the 20,000-square-foot beer garden is the place to be! Click here to buy Festival Tickets. *Subject to change at discretion of CrossFit. Note: CrossFit reserves the right to sell single-day tickets at the door, if available. Mon., July 30 - 9 a.m.-5 p.m. Tue., July 31 - 9 a.m.-5 p.m.
Wed., Aug. 1 - 7 a.m.-7 p.m. Thurs., Aug. 2 - 7 a.m.-5 p.m.
Fri., Aug. 3 - 7 a.m.-6:30 p.m. Sat., Aug 4 - 7 a.m.-6 p.m. Sun., Aug. 5 - 7 a.m.-5 p.m. In the event an original ticket purchaser is unable to retrieve their tickets at will call, they must provide a letter authorizing another individual to pick up their tickets. This letter should include the confirmation number of the ticket purchase through Ticketmaster. The ticket transferee will be required to show a photo ID. The official virtual home of the 2018 Reebok CrossFit Games in Madison, Wisconsin, is the CrossFit Games Event Guide app, and it’s available on Apple and Android. The CrossFit Games Event Guide app allows users to track their favorite athletes and teams on the Leaderboard, make a personalized spectator schedule, and discover which athletes, venues and vendors are trending at the Games. Through the app you’ll also have access to venue maps, local Madison information and social-media posts. Stay connected through the app as the top athletes in the world fight for the title of Fittest on Earth. You can find answers to common questions in the Help Center. Below is a list of frequently asked questions organized by category. 1. When am I going to get my tickets? All wristbands are in the mail. For those who bought tickets to the 2018 Reebok CrossFit Games and opted to have their wristbands shipped, the mailing process has begun. 2. I live abroad and will be traveling soon, but haven’t received my wristbands. What do I do? If it comes time to travel, and you still have not received your tickets, please contact crossfitgames2018@fulfillmentsupport.com. 3. Am I supposed to get a confirmation e-mail when I register my RFID wristband? You will NOT receive a confirmation e-mail upon registering your wristband. As long as you fill out all of the requested fields and hit submit, your wristband will be registered! Once you put on your bracelet, that ticket is yours. It cannot be passed or transferred. Once the RFID is on your wrist and checked in, it's yours for the weekend and can't be rescanned for someone else. However, re-entry to the event is permitted with your bracelet. 4. I have a "Festival Ticket - General Admission" for the week. Will I be able to enter the Coliseum? The Festival Tickets get you into everything but the Coliseum. 5. Will CrossFit release more Coliseum Tickets? We encourage you to look into Festival Tickets for experiencing the Games this year. Alternatively, unwanted tickets are being advertised by the community at the pinned post in the #SeeYouinMadison group. 6. Can I resell or transfer my ticket to another person, even though they are registered to me? Your wristband is transferable up until the point it is registered and fastened onto your wrist. Do not put it on until the morning of the Games. Alternatively, unwanted tickets are being sold by the community at the pinned post in the #SeeYouinMadison group. 7. Will I be able to buy general admission tickets on site? 8. Do I have to buy a parking pass for each day? Parking is free for spectators on a first-come, first-served basis. 9. Do journalists and reporters have to buy a ticket? Get in contact with the press team. 10. Do I need to buy tickets for my kids? Kids 12 and under will receive free Festival Admission but will need tickets or passes if they wish to enter the Coliseum or one of the Madison Club locations. Children under age 2 who do not need a physical seat will be considered lap babies and do not need a ticket for the Coliseum or Madison Club locations. 11. When can I collect my tickets from will call? Tickets can be collected starting 9 a.m. on Monday, July 30. You can find more information about will call here. Monday, July 30 - 9 a.m. to 5 p.m.
Tuesday, July 31 - 9 a.m. to 5 p.m.
Wednesday, Aug. 1 - 7 a.m. to 7 p.m.
Thursday, Aug. 2 - 7 a.m. to 5 p.m.
Friday, Aug. 3 - 7 a.m. to 6:30 p.m.
Saturday, Aug. 4 - 7 a.m. to 6 p.m.
Sunday, Aug. 5 - 7 a.m. to 5 p.m.
12. Does a Coaches Pass get you access to the Coliseum? No. A Coaches Pass provides spectator access inside the Coliseum only when their athlete or team is competing (specific heat). It does not provide a seat in the Coliseum otherwise. 1. What vendors and exhibitors will be at the Games? You can find a list of the vendors here. 2. What time will events begin on each day? A preliminary schedule has been posted here. 3. Which side attractions are taking place during Games week? Several CrossFit seminars are taking place in various boxes in Madison from July 28-29. These are listed here. Details of the CrossFit Health Conference (July 31-Aug. 2) can be found here. Information about additional side attractions will be added as it becomes available. Events organized by the wider community are also being advertised in the #SeeYouinMadison group. 4. What am I permitted to bring into Festival and Coliseum areas? Backpacks and reusable water bottles are permitted. Water stations will be placed at various locations across the site. A list of prohibited items are listed here. 5. Where can I train? There are many affiliates surrounding Madison, many of whom are offering deals on passes to spectators. A map of affiliates can be found here. 6. What are the camera restrictions? Can I bring my DSLR? You can read about the camera policy here. 7. Will there be a place to keep my bike (padlocked) at the venue? Yes. There will be a bike valet and lock-up area. 1. Will volunteers be allowed to attend seminars and side attractions? Yes, volunteers may attend if they are off duty. 1. Will the CrossFit Games be live on CBS or aired at a later date? We'll make an announcement that provides coverage information as the Games approach. 2. Is there a site that has info on the schedule of events? There are elements of the CrossFit Games that are not released until the competition nears or even moments before the event starts. Announcements will be made as information is released. New information will become available via the CrossFit Games Event Guide app and the information pages. 3. Does CrossFit sell the equipment from the Games? Rogue Fitness will be releasing used Games gear at the booth throughout the weekend. Stop by the booth for current updates. Fittest in Cape Town 2019 is Live!